A Directory of South Yorkshire Brewers. 1758 - 1995. Published by the Brewery History Society, 102 Ayelands, New Ash Green, Longfield, Kent DA3 8JW. ISBN 1 873966 05 9. A4 Paperback; 122 pages; price £10.00, plus P&P. Yorkshire Author and brewery history specialist, David Lloyd Parry, has had the fruits of his many years of research into the breweries of South Yorkshire published by the Brewery History Society. This directory lists nearly 100 common brewers from Barnsley to Wath, including 69 pages on Sheffield brewers. Many famous names appear here - Tennant, Barnsley, Ward, Stones, Hope & Anchor, Whitworth Son & Nephew. Pub acquisitions (with dates) are also listed. Numerous illustrations and a detailed index. This is Brewery History Society member David Parry's fifth book, all on Yorkshire, and it is also the Society's fifth publication. Produced in A4 size in the Society's standard format, the perfect binding and two colour plasticised cover features a lovely evocative view of Windle's Old Exchange Brewery, Doncaster, and the informative text of some 92 breweries is illustrated with 79 scarce beer labels and letterheadings, and also ten photographs. The pages have an illustration on almost every page, supplemented by our three generous sponsors adverts which has made the publication of this book possible. Naturally many breweries featured were in Sheffield, the second metropolis of brewing after Burton-on-Trent, but unusually David has been able to include the public houses which the companies acquired and the dates of purchase. Surprisingly two of Sheffield’s newest breweries, the Kelham Island Brewery and the Frog & Parrot, renowned for brewing the strongest beer in this Country, both of the new wave of micro-brewers, only have a short entry compared to some of their larger brothers which have several pages - as yet these smaller breweries have not had time to build up their own histories. Only time will tell. Local Yorkshire social and architectural historians besides brewery historians, will find this an excellent reference book, written in an enjoyable style, bringing interest into many facts and dates. An excellent and invaluable work which the author and the Brewery History Society should be proud of. My roots are in South Yorkshire although it was called the West Riding in those days and I have been a Barnsley supporter for most of my life, both of the football team and, until its demise, of the famous Bitter. My first drink of beer was at the Cross Keys in Darfield between Barnsley and Doncaster, although this was from the Melbourne Brewery of Leeds and is outside the scope of South Yorkshire Stingo by David Lloyd Parry, the latest of the Brewery History Society's publications. Mr Parry's objectives are pretty clear. The book is sub-titled as 'A Directory of South Yorkshire brewers 1758-1995' and you can't put it clearer than that. It follows two pamphlets in which the author was involved, both from the Neil Richardson stable and covering much the same territory as this new book. It draws together the previously published material brought up to date by some careful and obviously painstaking research and presents it in a thoroughly enjoyable yet practical manner. Sheffield obviously dominates the brewing scene of South Yorkshire through the period of this book. Even today the only major breweries in the county are in that city. Just two of them and one of those under threat. Yet in its heyday around the turn of the century there were more than 30 common brewers in the city. Barnsley and Rotherham were both influential brewing towns but which today produce nothing. There were also the substantial breweries of Darley's at Thorne (still of blessed memory) and Whitworth's of Wath upon Dearne which followed the Barnsley Brewery into the John Smith coop. Doncaster had several small breweries but none had more than 16 tied houses. It will come as no surprise then that the entries for Sheffield cover 70 of the 108 pages devoted to the directory and it is where the most interesting tales are to be found. Here are unravelled the complications of the antecedents of Ward's Brewery and how the coincidental combining of Hope and Anchor came about. The stories are told of the remarkable ascendancies to fame and fortune of William Stones and the Tennant Brothers. Also of the fate of Rawson's Brewery in which the Luftwaffe came to the aid of Sheffield Corporation. In 1938 the council was considering taking over the site of the brewery in Pond Street to build a new technical college. The war put a stop to that but in December, 1940, it was flattened by German bombs and came to life later as the Polytechnic. The book poses a question as to why should South Yorkshire brewers be prone to mental illness but offers no answers and why should it? Here is research for some future chronicler. Henry Tomlinson the owner of the Anchor Brewery acted most strangely on the day of his death and made three - two obviously unsuccessful - attempts to commit suicide. Robert John Bentley of the ubiquitous Bentley family who owned Bentley's old Brewery in Rotherham was declared 'a person of unsound mind' and sent to an asylum near London. Additionally, the firm of Nanson and Co of the Lady's Bridge brewery in Sheffield was wound up with the death of one partner and the 'unfortunate decline into insanity' of the other. There is a lot of detail in this book with long lists of pub acquisitions and sales. But there is much more, even a put down for the verbose and pedantic Alfred Barnard who described Truswell's Brewery as "built in the midst of some of the principal buildings of Sheffield.." when in fact the brewery was not purpose built but a conversion from other buildings. He is also accused at one stage of having no sense of humour and not seeing the comic effect of Colonel Thomas Rawson riding out across the moors shouting "To arms, the French are coming" after a beacon had been lit by mistake. If I were to be churlish and name one albeit minor fault it would be the lack of an explanation of the word 'Stingo' in the book's title. My own researches show it to be the name of a style of strong ale mainly associated with Yorkshire although I also found a reference to 'Birmingham Stingo' in Hackwood's tome. In the early 1960s I drank such delights as Watney's Red Barrel in the Yorkshire Stingo pub in Marylebone, a classic Georgian pub vandalised to build a modern monstrosity. But I digress. South Yorkshire Stingo is a remarkable piece of research covering nearly two and a half centuries of historical facts, figures, illustrations and occasionally the odd opinion. 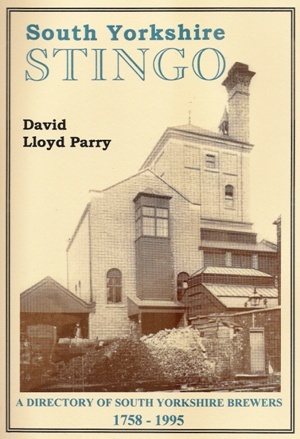 The breweries of South Yorkshire have found a true champion in David Lloyd Parry and he and the Brewery History Society deserve congratulations for having the courage to bring out such a book which no commercial publisher would touch with the proverbial barge pole. It will have an honoured place in my library.